For the first time in a long time, we are spending the Fourth of July in the U.S., and it feels great to be part of our nationwide birthday celebration. 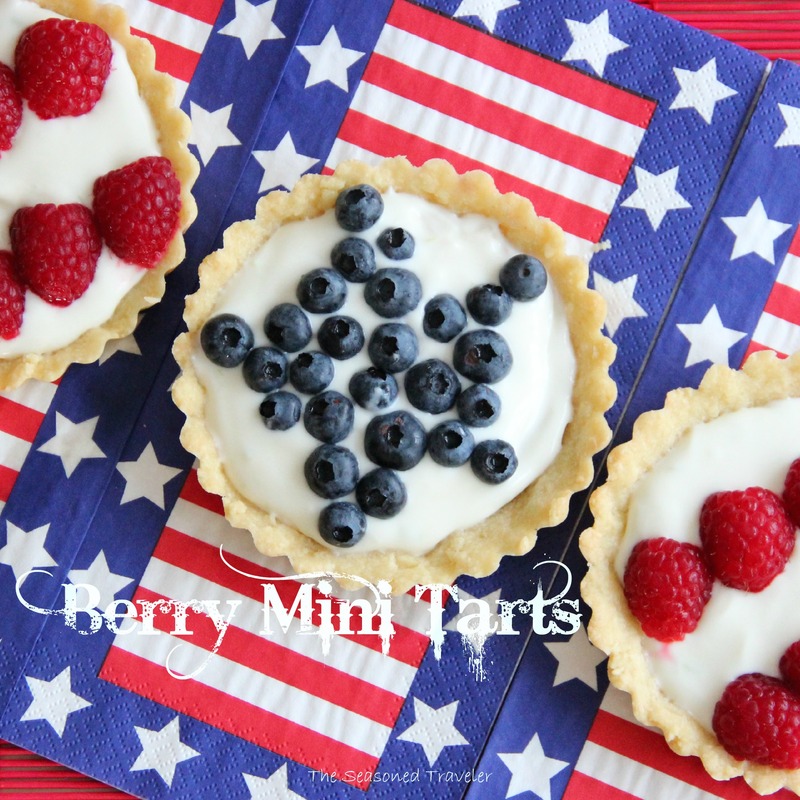 These red, white, and blue mini tarts are a simple dessert for the occasion, with fresh summer berries, a creamy filling, and shortbread crust. They are easily adaptable to flavors of your choice — I used quark in the filling, but mascarpone or even cream cheese or yogurt would work nicely. I made a coconut shortbread crust, but cinnamon shortbread would also complement the berries here. While these tarts are not fancy, and the decorating is far from perfect, they’re rustic and free, like the best of the American spirit. Happy Birthday, U.S.A.
Preheat the oven to 350F/ 180 C. Cube the butter and set aside. In a large mixing bowl, combine the dry ingredients for the crust with a whisk and mix well. Add the cubed butter and use clean hands to form it into crumbly dough. Divide it into thirds and press it into three tart pans. Place the tart pans on a baking sheet and bake until slightly golden, about 15 minutes. Remove from the oven and let cool on a cooling rack. Meanwhile, mix together the filling ingredients; taste and adjust the ingredients for sweetness and flavor. Wash the berries and set aside. When the tart crusts have cooled, spoon the filling in and decorate with the fresh berries. Lovely little tarts!! Patriotic to boot. I also make a coconut pastry crust, it’s wonderful. Happy 4th of July!! Sweet and easy. Love these Star Spangled tarts. 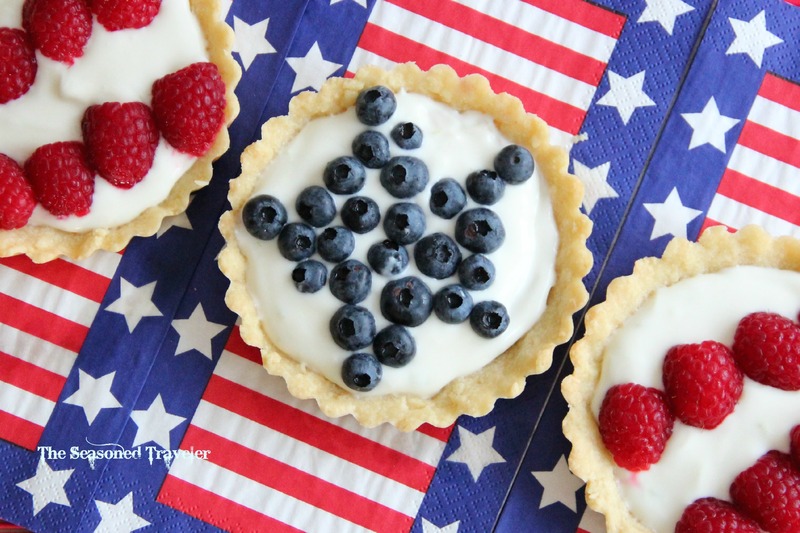 Oh, Star Spangled Tarts, that has a nice ring to it – thanks! These are truly easy and fun. Celebrate with yummy summer salad recipes.. Thanks so much, I think you’ve articulated just how I feel – it’s great to be home and soaking in the spirit of the 4th and summer fun. Hope you have the chance to do so next year! Thanks, hope you had a great 4th too! Such cute little tarts! I love how you added coconut to the crust. These tarts are so pretty and festive, Laura!